I think next year, instead of running that newspaper stalwart the Review of the Year, I might suggest a round-up of Front Pages That Never Were. If you can’t see what needed to be changed, well done for having a mind free of snark. 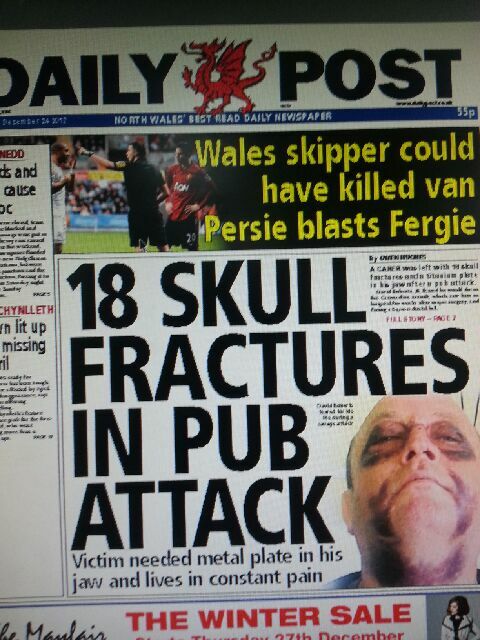 If however, you are now rolling on the floor hooting at the idea of a Wales Skipper Could Have Killed van Persie/18 Fractures in Pub Attack double-act, then you’re exactly who we had in mind when we decided we Just Couldn’t. You prompted us to redo the blurb, sans RVP’s footballing brush with death; you helped edit that front page. Because although they are obviously different stories, it’s way too easy to see them as a mash up. When a newspaper fouls up, especially on the front page, some users laugh, some reach for the caps lock and just about everyone reacts like no one has ever made a mistake in the history of the world before. I view it a bit like an entire street rushing to surround a postman and collectively yell at him YOU DELIVERED THAT LETTER TO THE WRONG HOUSE!!! PATHETIC POSTMANISM!!! I also tend to take a ‘there but for the grace of God…’ approach when other publication’s blunders are crowed over and, ultimately, everyone loses interest and moves on after a few hours; Twitterstorms burn bright, but don’t generate a lot of heat. Nevertheless, it’s a good tool for the development of audience-informing-content. No matter what sort of ding it gives to one’s ego, the fact that social networks allow people to give instant feedback – often unfiltered – can be a learning experience. 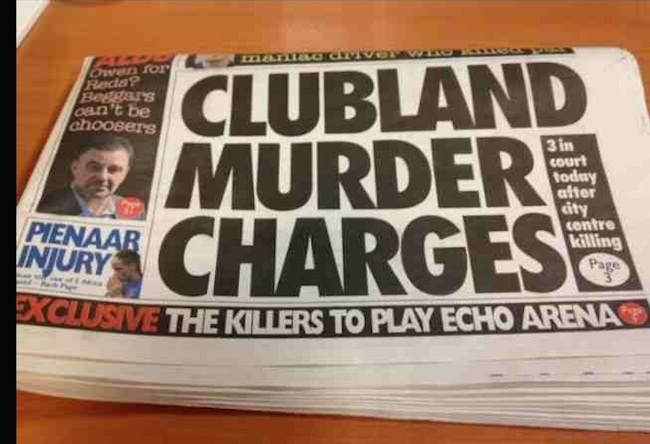 Juxtaposing straps or headlines like this has happened for years; pre-internet they might find their way into Press Gazette or Private Eye, and there would be some gentle ribbing. 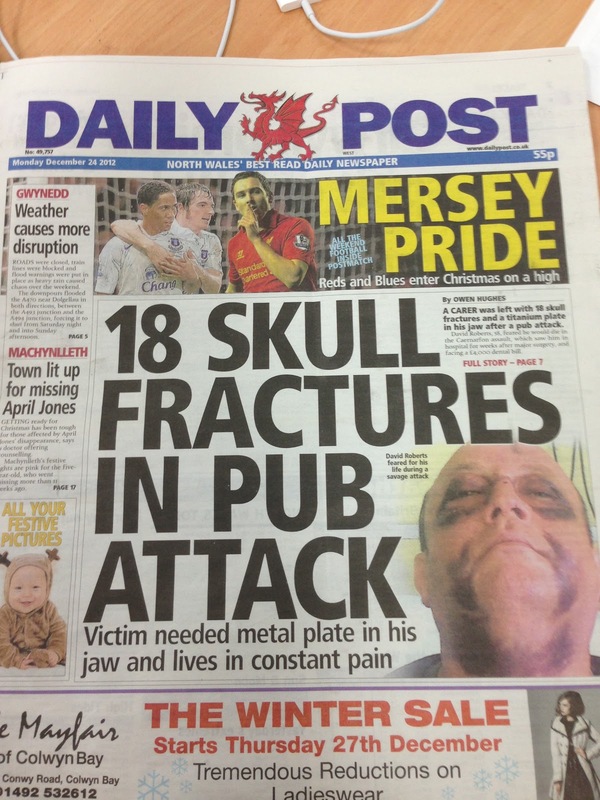 I can’t say if the Daily Post‘s clashing juxtaposition would have led to an outpouring of online hilarity but I can identify it as the sort of clash that has the potential to. Knowing what triggers the social hive mind (be that lolcat, tyop or sweet little video of a blind dog with a guide cat) is handy, and it translates from online into print more often than not. We’ve historically been told “Write for your readers” – to have that everyman/everywoman in mind and make sure we connect with them, to be ‘Like Us’ and hit our demographs. But now our readers aren’t limited by geography or print availability any more – some of my readers might never have set foot in North Wales, but they are – sometimes fleetingly, sometimes deeply – engaging and becoming a part of the creative process, via the internet. Tweeting photos of the creation of Wales on Sunday’s front page ahead of print deadline on a Saturday night helped market the paper; got people talking about us and sharing the front. More memorably, it massively spared our blushes once, when a follower pointed out a typo in a footballer’s name. It’s important to me that the Daily Post is shared socially every night, for those reasons and for one more – with our policy of talking about what we’re doing, on the liveblog or on social networks, it’s puts the cap on a day’s work for us and for our Facebook and Twitter networks, where friends and followers might have been following our progress and contributing. So, there‘s my rather upbeat view on the nature of snark. Of course, the next time the Daily Post makes a mistake (like this – fleetingly online, ffs, but screengrabbed forever, of course) I will be as cross with the interwebs as ever. Until the bandwagon rolls on to the next unfortunate, of course. * Dan suggested I use the Daily Post’s Saturday editor’s column to talk about on how we decide what the front page looks like – I did pen a less detailed version for that, but had so many thoughts around the subject that didn’t fit into a 370 word template (and that probably weren’t of any interest to my readers) I figured it was worth firing up the blog to post something. Belatedly. Fantastic spot and one I didn't fathom instantly. I think my careworn December attitude is hanging over early January. Must sharpen up – thanks for delivering a kick to the cerebral mass!